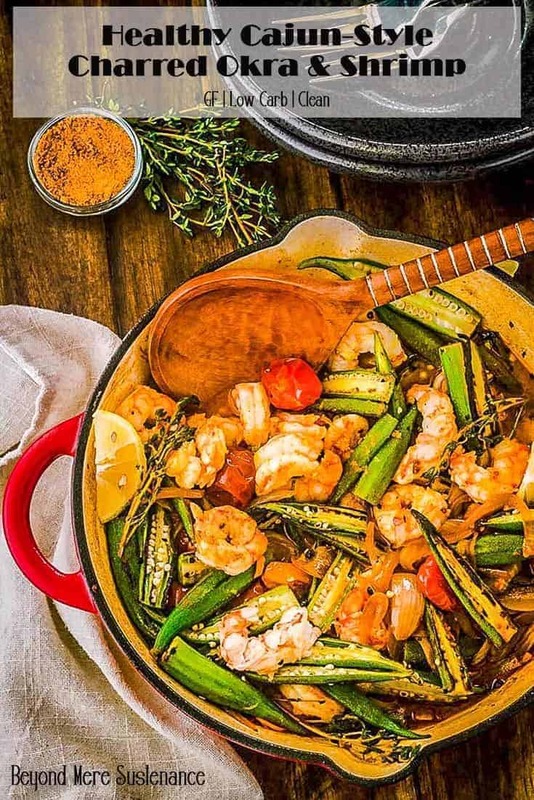 A screaming hot cast iron pan is the key to Healthy Cajun-Style Charred Okra and Shrimp… The flavors of gumbo – thyme, paprika, cayenne, garlic – without the fat-laden roux. Ready in under half an hour, this one-pot dish is likely to become a new family favorite! Cajun or creole? Gumbo is a signature dish for both, the former being roux based, and the latter being tomato based. Cajun gumbo is a dish I crave a couple of times a year, and I usually make it at least once. My roux is a dark chocolate brown, and made with a 1:1 ratio of oil to flour. FATTENING. It really doesn’t meet the definition of “healthy with global flair” (my blog tagline). When I see all the fresh, gorgeous okra start appearing at our local markets, my mind automatically goes to shrimp and okra… and gumbo. We do love my Curried Okra and Eggplant, but where’s the gumbo? 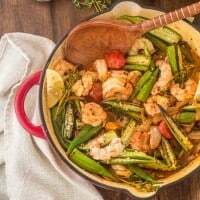 This okra season, I was determined to create a dish reminiscent of Cajun gumbo without the fat and calories that cling to it like fuzz on a peach. My biggest concern was the SLIME. That SLIME that makes half the people that try it hate it. 😯 I was afraid that a simple stir-fry technique would leave that slime on the okra. Jump to the Recipe! 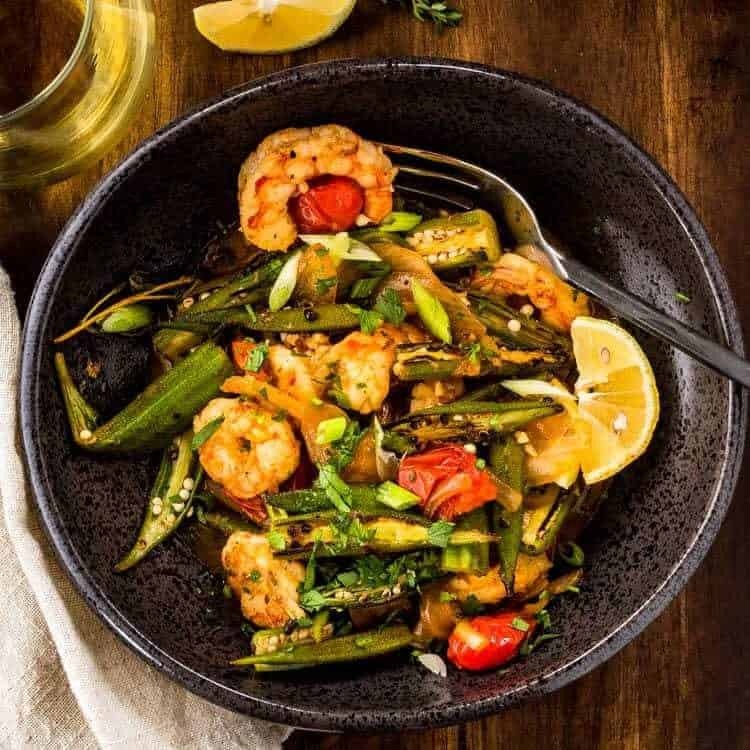 Keep in mind this Healthy Cajun-Style Charred Okra and Shrimp is GLUTEN FREE. LOW CARB. LOW FAT! What are you waiting for? Enter charred okra. After years of working with blistered, charred Hatch green chile, I am fully aware of the intense, complex flavor achieved through the process. To confirm my thought process, I googled “charred okra,” and came up with lots of hits! I decided to give this method a try combining tiny tomatoes and Gulf shrimp with Cajun seasonings. If you’re concerned about sustainability (as I am), my favorite resource is Monterrey Bay Aquarium. As I mentioned in the intro, a cast iron pan is essential. They’re simply superior in distributing and cooking with extreme heat. I use refined coconut oil with a high smoke point. Vegetable oil is fine too. Olive oil has a much lower smoke point, and you’ll burn the oil! Obviously the okra gets charred. (It’s in the title DUH). 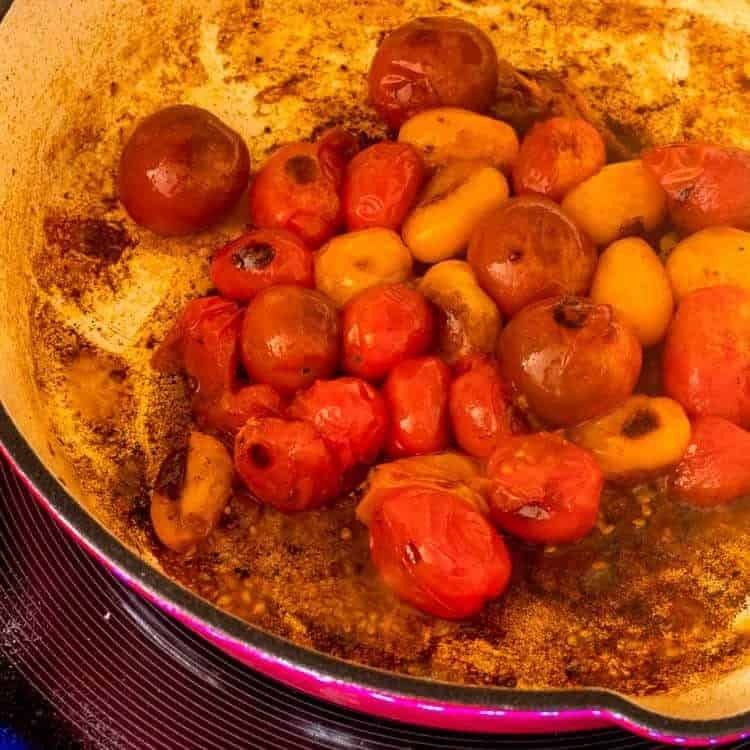 I love to bump up flavors, and I decided to use the same technique on the tomatoes, sweet onion, and shrimp as well. They line up and take turns getting scorched in that hot pan. I then de-glaze with white wine, broth or stock, and lemon juice, toss in a bunch of fresh thyme, minced garlic, and Cajun spice mix. Only then do the charred components go back into the pan for a quick soak in the pan sauce. You can serve this over brown or white rice, quinoa, etc., but we’re watching calories and carbs, and skip it. You might also choose to serve it with a chunk of grilled bread. The Cajun gumbo flavor is there, but it is an exceptionally light and flavorful dish. Best of all, it’s ready in less than 30 minutes… even with a glass of wine and good conversation! I prefer the flavor of wild-caught shrimp. Since moving to the Rio Grande Valley, I’ve developed something of a love affair with Gulf shrimp. Unfortunately, we only get them in the shell with that nasty vein. I often put my hubby to work peeling and de-veining them, but that’s a 30 minute task (even for the 2 of us). Just this summer, I tried Argentine wild-caught shrimp that were peeled and de-veined. I can literally get this meal ready in 15 minutes using peeled and de-veined shrimp. Sadly, though, those Argentine shrimp won’t go in my cart again as they’re on the “avoid” list in the sustainable fisheries lists (due to bycatch). If sustainability is important to you (if not, it should be 😉 ), look for peeled and de-veined from a “best choice” or “good alternative” source. The time savings makes a meal like this a great option for busy weeknight cooking! 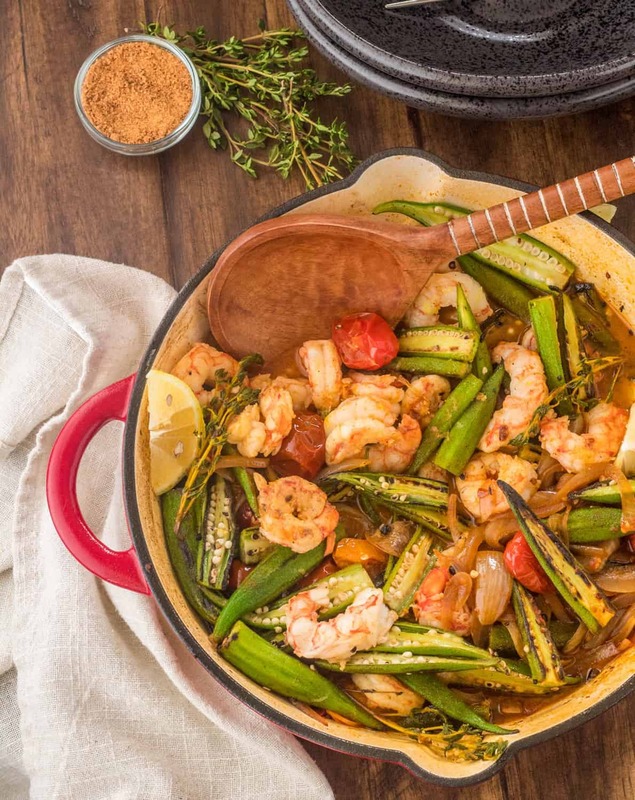 Mis en place is imperative in a quick-moving recipe like Healthy Cajun-Style Charred Okra and Shrimp. Assemble all of your ingredients, prep the shrimp (if necessary), slice the okra, tomatoes, and sweet onion. If you need to mix up a spice mix, have that ready as well. I slice the lemon, and portion the wine and broth for the pan sauce. Prepare your garnishes as well. Once you start cooking, this dish is done in 10 minutes! Finally, I keep gumbo filé in my well-stocked pantry. Gumbo filé is made with the dried and ground leaves of the North American sassafras tree. There is no substitution IMHO. If we’re out of it, I’ll still make the dish, but I’ll be sad… Finish off the dish with a sprinkle of gumbo filé, and chopped parsley and scallions. 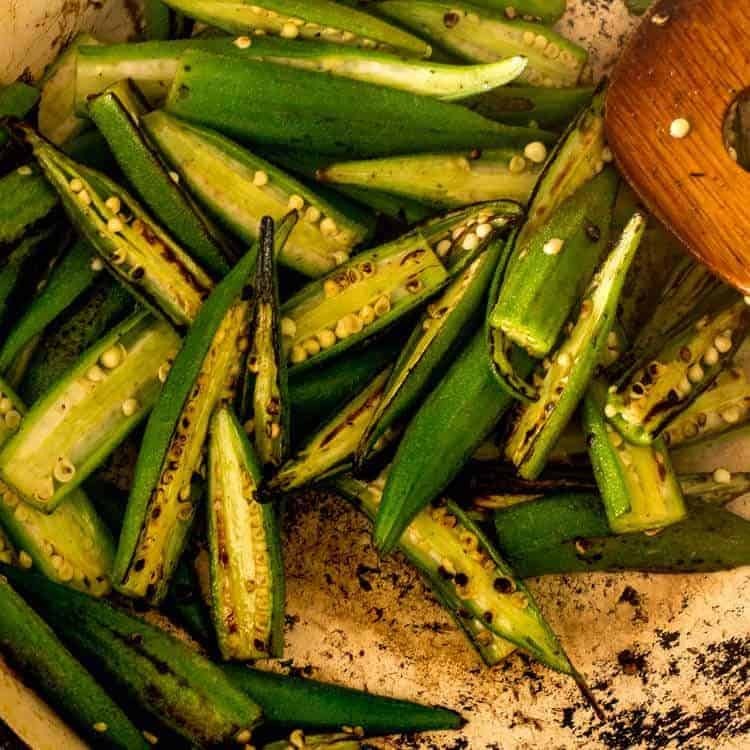 Do you like the concept of charred okra, or does it to closely resemble burned food that ought to be scraped into the trash can? Honestly, I can’t wait to hear your thoughts on this one… Please leave (thoughtful and kind) comments at the bottom of the post. The flavors of gumbo - thyme, paprika, cayenne, garlic - without the fat-laden roux. Ready in under half an hour, this one-pot dish is likely to become a new family favorite! Add the oil to a heavy skillet (ie. cast iron) over high heat. When it is scorching hot, add the okra. Do not stir until you see edges charring. You want some nice color. Stir only enough to turn the okra. When you have a good amount of charring, and the okra has lost its "slime," remove them from the hot pan. This process takes about 3 minutes. Add the sliced sweet onion, cooking on high heat until the onions soften, and get some color on the edges. Remove from the pan. Add the shrimp to the pan, stirring occasionally until the shrimp are opaque but not dry. This only takes 2-3 minutes. Dried out shrimp isn't good! Remove from the pan. De-glaze the pan with white wine, stirring to loosen any browned bits. Add the broth/stock, lemon juice and zest, thyme sprigs, and spices. Bring to a boil, then simmer about 5 minutes to reduce slightly. Add the shrimp and veggies back into the pan. Stir to combine. Turn off the heat. Remove the thyme sprigs. Garnish with chopped fresh parsley and gumbo file. Enjoy! I add each component to a large prep bowl as it comes out of the pan. Add a little more oil if needed. 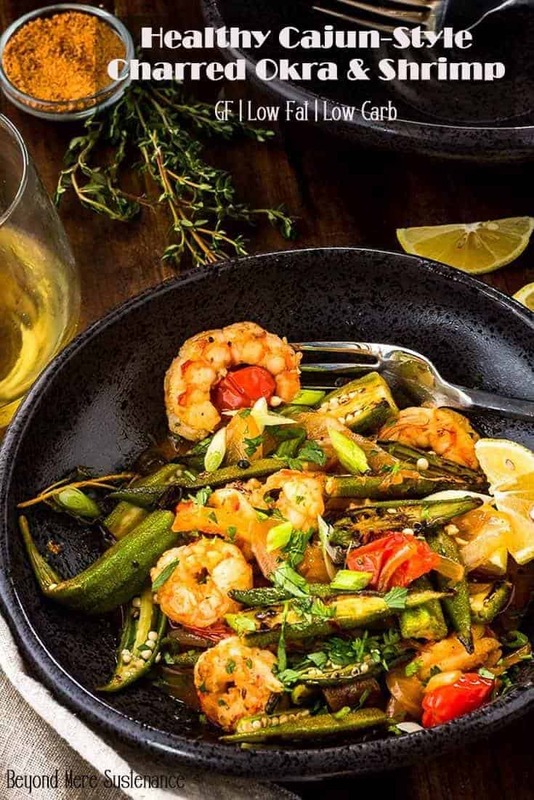 As I mentioned in the post, you can serve Healthy Cajun-Style Charred Okra and Shrimp over rice, quinoa, grain, grits, polenta, or with grilled bread. Or not. 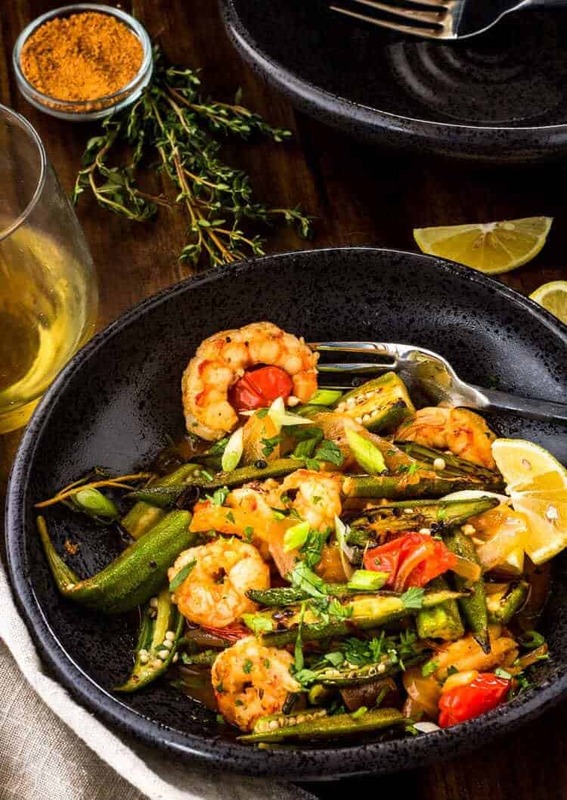 We just enjoy it as a one-dish meal that's healthy, low-carb, and delicious! Please read the post. Cajun spice mixes may be very salty, low salt, and no salt depending on what you use. It also contains cayenne. If you're not familiar with it, reduce the amount, and add after tasting. Macronutrients (approximation from MyFitnessPal): 365 calories; 42 g protein; 20 g carbohydrates; 7 g fat. I had about 2 lbs of okra that I wanted to use so I made this for dinner last evening and it was DELICIOUS. I did not cut the okra, and used a red onion instead of a sweet onion. Otherwise I followed the recipe as written. Served with brown rice. Very impressive presentation as well. Company worthy !! This recipe looks amazing, Tamara. If you live on or near the gulf, a shrimp deveiner is an essential tool. This peels and deveins the shrimp in one quick pass. You can pick one up for a couple of dollars at your local fish monger. That way you can enjoy your local, never frozen shrimp and support the local fishing economy. Thanks Dan! I rarely buy shrimp that are not local unless I'm in a hurry. I will look for a shrimp deveiner next time I'm at the Gulf. It's about 47 miles "as the crow flies," and 70 miles by vehicle. Hi Tami, You have shown me the very first recipe for okra 'anything' that I will try. Sounds so yum and easy too. Thanks. Yay! That's what I love to accomplish :-) Please let me know how you like it!